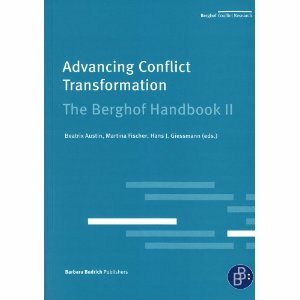 The Berghof Handbook for Conflict Transformation is Berghof Conflict Research’s key publication. Constantly evolving and developing, this online platform presents cutting-edge knowledge and experience for scholars and practitioners working on transforming violent ethnopolitical conflict. including a wide range of voices and perspectives from different regions throughout the world, as well as from multiple disciplines and faculties. The Berghof Handbook for Conflict Transformation is a comprehensive and cumulative website resource that provides continually updated cutting-edge knowledge, experience and lessons learned for those working in the field of transforming violent ethnopolitical conflict. The website content comes from two central resources: 1) commissioned Articles by leading experts from current practice and scholarship; and 2) a Dialogue Series on key issues, in which practitioners and scholars critically engage and debate with one another in light of their varying experience. Dialogues, along with a 2004 and a 2011 version of the main body of the Handbook, are also distributed in print. The Berghof Handbook is not attempting to summarise the consolidated knowledge of a well-established discipline. It is an effort to draw attention to established practices and concepts, as well as to thorny issues and challenges. Instead of presenting a collection of recipes or ready-made tools, our goal is to put these established practices into a broader conceptual framework in order to understand their functions, strengths and weaknesses. If you would like to see a complete list of articles, please click here.